Acclaimed choreographer Ronald K. Brown and company Pittsburgh-premiere a work honoring Teenie Harris and Pittsburgh Jazz. A collector of postcards, New York-based choreographer Ronald K. Brown was not aware that he had in his collection -- indeed, had once plastered to the wall of a former apartment -- images by Charles "Teenie" Harris (1908-1998). He just knew the images spoke to him. He discovered the pictures' provenance when he was introduced to the famed Pittsburgh photojournalist's work by Neil A. Barclay, president and CEO of the August Wilson Center for African American Culture. In 2006, Barclay commissioned Brown to create a dance celebrating Harris' photographs -- taken in neighborhoods like the Hill District while Harris worked for the Pittsburgh Courier -- as well as Pittsburgh's jazz roots. For Brown, it was a match made in heaven: The abiding social conscience and strong sense of African-American community often seen in his work is likewise embodied in Harris' photographs. 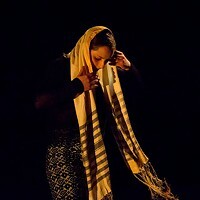 The dance work, One Shot: Rhapsody in Black and White, makes its Pittsburgh premiere on Sat., May 2, at the Byham Theater. Brown's company, Ronald K Brown/Evidence, will perform the 90-minute multimedia piece without intermission. One Shot is set to music by Billy Strayhorn, Ahmad Jamal, Lena Horne and others, as well as Cuban rap. 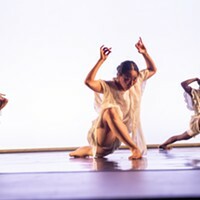 Brown employs a mix of West African, jazz and modern dance styles. "One Shot" was Harris' nickname, because he rarely required the subjects of his often-posed photos to hold for more than one exposure. The dance is framed in seven sections, each centered on a theme, such as prayer, hope, service and decadence. The action on stage is accompanied by projections of 31 of Harris' photos, shot between 1935 and 1975. The photos were gleaned from the Carnegie Museum of Art's collection, which contains some 80,000 images attributed to Harris. "Working with Clifton Taylor, who did the photo integration, we tried to make the images and dance become sort of a tapestry," says Brown via telephone from a performance stop, in Nashville. "One where the dancers become part of the picture as if in the same frame, showing the life in the photograph rather than trying to imitate it. "I love how Harris captured the mentoring of young people and their relationship with elders -- something I feel is lacking in today's society," Brown adds. Accordingly, Brown also uses a lot of stillness in the work, reflecting the solemn nature of some Harris photographs and a reverence for the past. "You don't know what is possible if you don't know what has come before you," Brown said in a podcast interview about the work. The 42-year-old Brown, who started his company at age 19 and who has earned numerous accolades since then, is in many ways a throwback to times reflected in Harris' earliest photos. In those pictures Brown sees the ideals he tries to live by, such as respect for oneself and one's community. "You see in Harris' photos that regardless of how much money you made, when people went out they dressed to the 'T'," says Brown. "Now in our culture we dress any kind of way. I think even in terms of dignity we can learn from these pictures."